In a thrilling finish of the Gr.1 Unibet Irish Gold Cup, Tattersalls Ireland graduate BELLSHILL came out victorious when clinching the title for Graham and Andrea Wylie, Willie Mullins and Ruby Walsh. 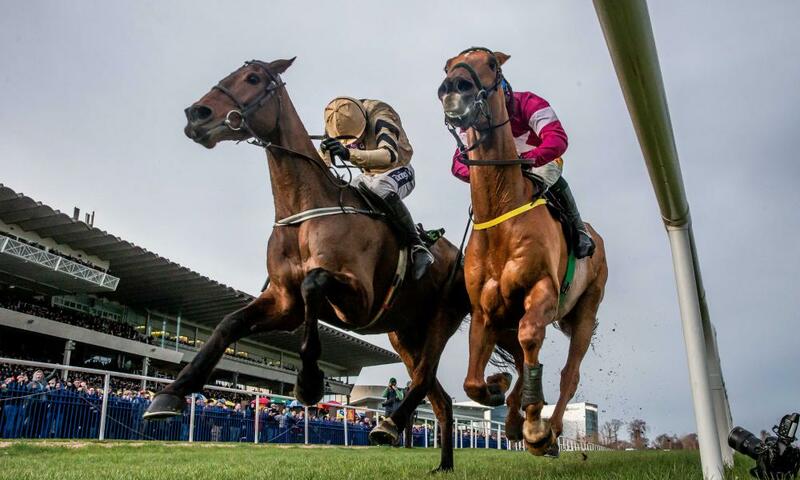 In an electric performance which saw the nine-year-old glide over fences, BELLSHILL booked his ticket for the Cheltenham Gold Cup when delivering such an emphatic performance. Bred by Frank Motherway in Co Cork, BELLSHILL was sold as a foal at the 2010 November NH Sale by Yellowford Farm for €21,000 to Ian Ferguson. On Saturday, COMMANDER OF FLEET opened Tattersalls Ireland's Dublin Racing Festival account by taking the Gr.1 Nathaniel Lacey and Partners Solicitors Novice Hurdle. He proved himself a real staying type by making gradual headway and getting his head in front of the field just after the final hurdle, winning the race for Gigginstown House Stud, Gordon Elliott and Jack Kennedy. The four-time winning five-year-old was purchased at the 2014 November NH Sale when selling to Mount Eaton Stud by Egmont Stud for breeder Patricia Coughlan for €35,000. OFF YOU GO became the first horse in a decade to win the Ladbrokes Hurdle two years in a row. In the colours of JP McManus, trained by Charles Byrnes and ridden by Mark Walsh, the a six-year-old Presenting gelding travelled well throughout the race, picked up two furlongs from home and ran on strongly in the finish. OFF YOU GO, bred by Peter Collier, was sold by The Premier Consignment at the 2013 November NH Sale to John O'Byrne for €40,000. The Tattersalls Ireland sponsored Gr.1 Spring Juvenile Hurdle proved to be a strong edition with multiple representative from three of the top stables in Ireland. SIR EREC made it look simple with a near-polished round of jumping, winning the race for JP McManus, Joseph O'Brien and Mark Walsh. A Triumph entry is on the cards for this son of Camelot who was sold as a foal by Yellowford Farm at the Tattersalls December Sales for 170,000gns to Camas Park Stud.